right click and choose “print” to print these instructions. See our how to pan video. Place about a ¼ cup of paydirt or gold bearing dirt in pan. Submerge pan in basin of water and work content with your hands breaking it up. Pick out rocks and pebbles and throw them out, just make sure they are not nuggets! Hold your pan just under the surface of the water and vigorously shake it left and right. In this step you are causing the gold to move to the bottom of the pan. Tilt the riffled edge of pan downward and dip the pan in the water a few times. This washes the lighter material out and the gold gets caught in the riffles. Repeat step 3. Repeat steps 3 and 4 until there is about a tablespoon of material left in the pan. With a little water in the pan tilt the riffled edge of the pan up and swirl the water gently toward you, this should move the rest of the lighter material toward you leaving the gold in the front of the pan. Fill vial completely with water. Drain water out of the pan. Press a dry finger on the gold flake until flake sticks; wet finger with vial and flake should fall into vial. Alternatively, use suction tweezers or sniffer bottle if you have one. Add a few BB’s to gravel from outside and practice panning the BB’s. The sparkling black sand left with the gold can be picked up with a magnet, leaving gold behind. Re-pan the dirt in your basin to ensure you didn’t miss anything. Go out and find your own gold! Dirt on stream banks and under boulders is a great place to look, just make sure you are not claim jumping! 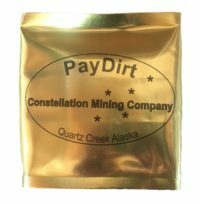 Read the story behind your paydirt! Read our mining blog.